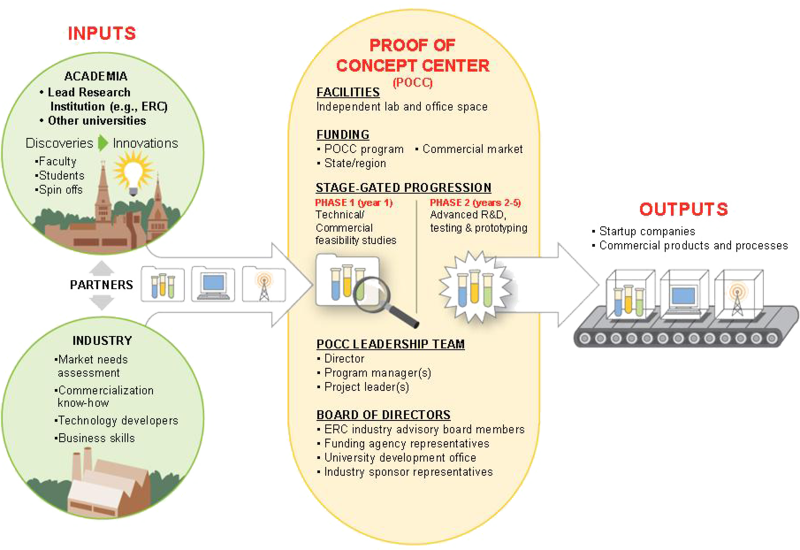 IN 2010, twenty current and "graduated" National Science Foundation (NSF) Engineering Research Centers (ERCs) responded to a Request for Information (RFI) from the White House on ways to foster the commercialization of university research through Proof-of-Concept Centers (POCCs). Their responses varied greatly in detail and format, but ERCs were uniformly enthusiastic about a new effort to move research projects into tangible concepts worthy of industry funding. POCCs are seen as closely related to the work at ERCs. The ERCs are viewed as one of the nation's most effective programs to date at commercializing research and see themselves as good partners, perhaps even hosts, for new POCCs. As part of their academic mission, ERCs organize multidisciplinary programs involving faculty and students across departments and campuses while industrial partners comprise a central element of their structure. Every ERC has undertaken POCC-like activities, such as the careful matchmaking needed to pair researchers with entrepreneurs that enable academics to participate in commercially developing their work while remaining with the university. The POCC-like programs at ERCs often succeed at least in part because of added funding from the NSF or other sources. POCCs would go beyond the ERC construct and provide the marketing, legal, and investment disciplines that are not typically part of an academic setting. Building on the ERC model, each POCC should focus on a specific cluster of related technologies and be located at a major research institution but would be open to researchers from other universities and encourage a diversity of ideas. A POCC would have its own laboratory and office space and would be managed by experienced entrepreneurs as a director and as a program manager. It could be built conceptually or geographically alongside an ERC, perhaps drawing its board of directors from the scientific and industry boards that already advise the ERC. Most ERCs saw their centers as a feeder to the POCC, which would be co-directed by academics and executives and thus offer deeper and broader relationships with industry. The POCC board, like the board of a venture-backed startup, could review plans and drive for results. The POCC staff would give small teams of faculty, entrepreneurs and students the support needed to attract outside funding and transform projects into going concerns or viable products. A formal "stage-gated" process would allow fixed periods for proving technical and market feasibility, and then for developing prototypes or otherwise proving market viability. As the project progresses, the POCC would require that a project attract matching funds from the private market. POCCs could also build on the limited success of incubator programs run by universities and local governments, as well as business-driven efforts that have suffered from a lack of technology insight. The federal government can again step in and underwrite a wave of activity that can bridge the "Valley of Death" that too often looms between promising academic research and commercial viability. The complete summary of report of ERC POCC RFI responses is here.